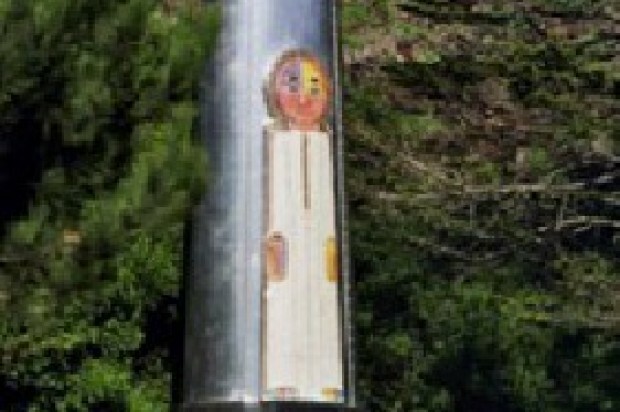 A 38-foot sculpture that was removed from San Francisco’s Brotherhood Way during construction of new housing has been returned to its home of nearly two decades and restored, officials with the San Francisco Arts Commission said today. 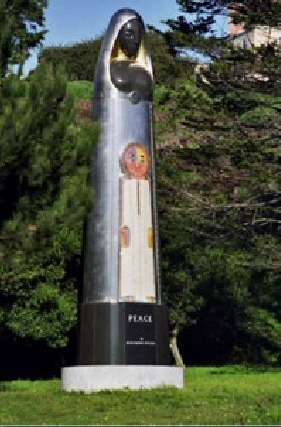 The “Peace” sculpture created by Bay Area-based artist Beniamino Benvenuto Bufano in 1938 is a conical Madonna figure built from granite, steel and glass that was displayed publicly at 700 Brotherhood Way, just south of the Parkmerced housing complex, from 1996 until last year. It was removed in March 2013 during construction of 182 new residential units but with the promise that it would return restored with new display lighting. The arts commission announced today that restoration is complete after conservators cleaned and removed corrosion from the steel, applied a protective wax coating and caulked a gap between the stone and metal to prevent water from getting into the sculpture. Bufano was an Italian American artist who worked in ceramics, stone, metal, mosaics and has several large sculptures publicly displayed in the Bay Area. The sculpture was moved to Brotherhood Way in 1996, when the new International Terminal and garages were constructed at SFO. Previous restoration work was done in 2009. “The Peace sculpture is certainly one of the finest examples of Bufano’s artwork in the city, and we are happy to have it back,” city Supervisor Norman Yee, who represents the area, said in a statement today.